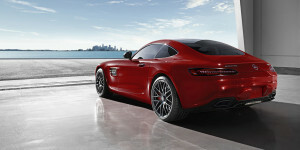 Sure, the AMG® GT boasts sensational style and a powertrain to match … but what other qualities does it offer? To answer that question succinctly: a lot. Standard features on the GT S model include an electronically controlled rear differential, an adaptive suspension, a dynamic exhaust system, LED headlamps, a pop-up rear spoiler, fore and aft parking sensors, as well as keyless ignition and entry. Talk about living the high life; this debonair dynamo most definitely delivers all on fronts. If you’d like to meet this magnificent model “in the metal,” or wish to put one through its paces on the open road, we encourage you to pay us a visit at our Beaumont, TX location. Stop by sometime soon, and we’ll be sure to set you up with a test drive in the incredible AMG® GT, or any other Mercedes-Benz model that may be on your radar screen.